This recipe for baked fried chicken is ultra crispy chicken that’s been baked in the oven for a lighter take on the classic. This oven fried chicken will quickly become a family favorite! As the weather starts to cool down, my cooking style tends to change. In the summer I’m all about grilling and salads full of seasonal produce; as we head into the fall and winter months it’s comfort food all the way. My family loves comfort food, who doesn’t?! But many comfort food dishes tend to be heavier in nature, which I’m not a fan of. 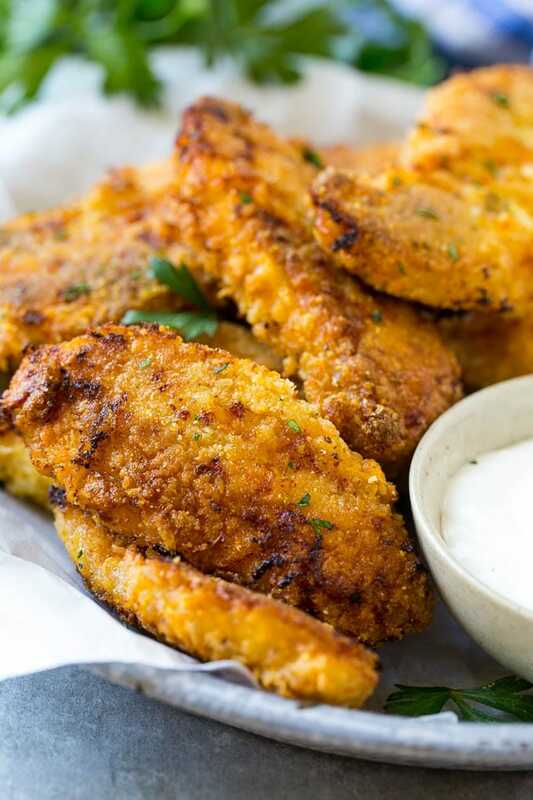 This baked fried chicken is a lighter take on the classic – it’s got the same crispy coating and tender juicy chicken, but without the deep frying! There are a few tricks to making this oven fried chicken extra crispy and delicious. The first trick is a dip in buttermilk. The chicken needs to marinate in the buttermilk for at least 30 minutes, or up to 8 hours. The other trick to this recipe is in the coating. Some people use cornmeal, some people use panko crumbs, others use flour; I use all three to get a crust that’s both flavorful and crunchy. The key to getting oven fried chicken that browns nicely is to bake it at a high temperature in a thin layer of butter. I pre-heat the oven, then add the sheet pan to the oven so that it’s hot before I even add the chicken. I add the butter to the hot pan, let it melt, then add the chicken pieces in a single layer on the pan. You do have to flip the chicken halfway through the cooking process for even browning, but it’s so worth it! 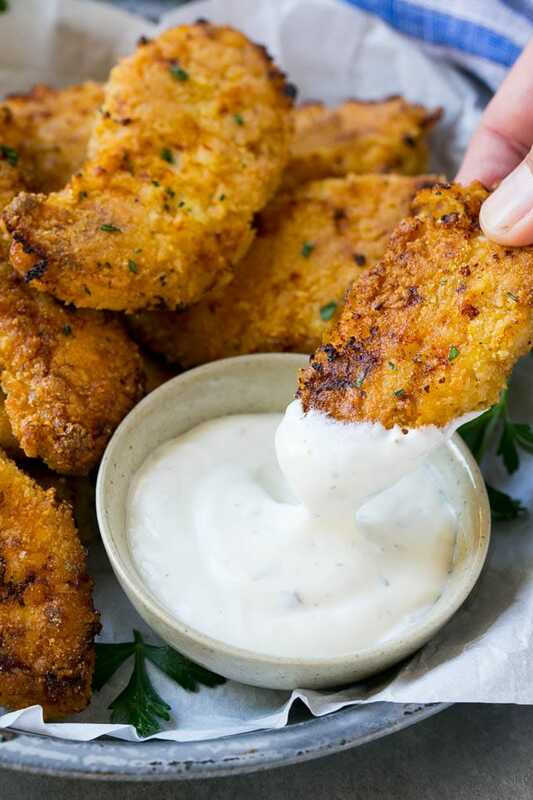 I like to serve my baked fried chicken fingers with homemade ranch dip, but they’re also great with BBQ sauce, ketchup or honey mustard. I make these chicken fingers a few times a month, because it’s a dinner my whole family loves with less guilt! This recipe for baked fried chicken is ultra crispy chicken that's been baked in the oven for a lighter take on the classic. This oven fried chicken will quickly become a family favorite! 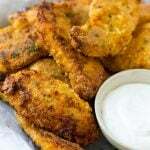 Place the chicken tenders in the buttermilk and marinate for at least 30 minutes or up to 8 hours. Preheat the oven to 425 degrees. Place an empty sheet pan in the oven for 10 minutes. On a large plate, mix together the flour, cornmeal, panko breadcrumbs, salt, pepper, onion powder, garlic powder and smoked paprika. 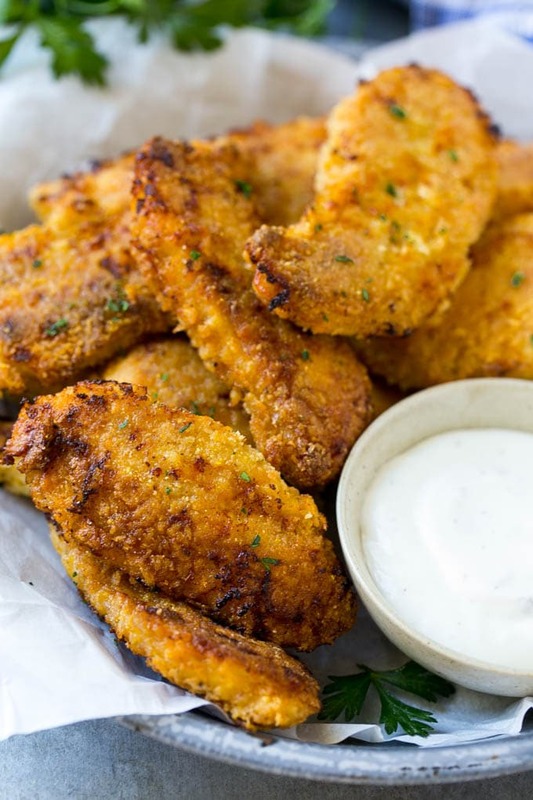 Take each chicken tender out of the buttermilk mixture and place on the plate with the flour mixture; turn evenly to coat. Repeat with remaining chicken. Remove the sheet pan from the oven and place the butter on it. Wait 2-3 minutes until butter is melted. Swirl the butter around the pan until the bottom is evenly coated. Place the chicken in a single layer on the melted butter. Bake for 10 minutes then flip. Bake for 8 minutes more. Broil for 2-3 minutes or until tops are crispy. Serve immediately, sprinkled with parsley if desired. This post was originally published on October 10, 2016 and was updated on September 6, 2017 with new photos and a new and improved recipe. This was formerly a sponsored post written by me on behalf of Foster Farms Simply Raised Chicken. I made this for dinner tonight and it was a hit! So easy and a lot of flavor! That chicken looks great! I can’t believe how crispy the outside looks when the inside is so moist and juicy. This recipe is a winner! I agree – this should be the new comfort food. I just hate to fry food in my kitchen but this I will do! The chicken looks so moist and tender – and perfectly cooked. Great recipe Sara! Looks great, I’ll definitely have to give this one a try. I love this comfort food chicken oven easy recipe! The granddaughters will really enjoy this! My family would love this! I buy Foster Farms Chicken as it’s always good quality!